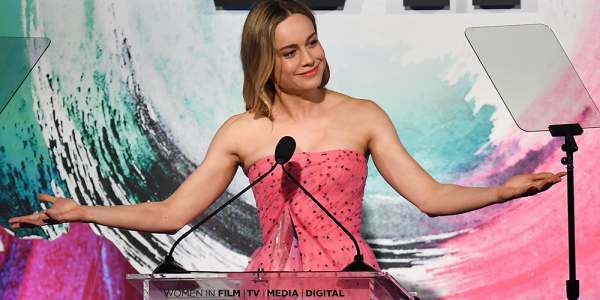 Actress Brie Larson called out the critics association for racial bias in an impassioned speech. Brie Larson was on hand to accept the "Crystal Award for Excellence in Film" Wednesday night at the Beverly Hilton. She dedicated her speech to talk about a recent study that showed a stark disparity between white critics and critics of color. The "Critic’s Choice" study, published by USC Annenberg on Monday. She said, "Of the 100 highest-grossing movies in 2017, less than a quarter of the critics were white women, less than ten percent were underrepresented men, and only 2.5 percent were women of color." The report is the first from Associate Professor of Communication Stacy L. Smith and the Annenberg Inclusion Initiative to "investigate inclusion among film reviewers and examines access and opportunity for film critics". The report uses reviews of the 100 top grossing films of 2017 posted on the site Rotten Tomatoes to assess gender and race/ethnicity of critics, finding that reviewers are overwhelmingly white and male. Of the 19,559 reviews evaluated, 22.2 percent were written by females, with 77.8 percent crafted by male critics — 3.5 males to every 1 female reviewer. White critics wrote 82 percent of the reviews and critics from underrepresented racial/ethnic backgrounds authored 18 percent. However, when the researchers examined both gender and underrepresented status, they found that white male critics wrote substantially more reviews (63.9 percent) than their white female (18.1 percent) or underrepresented male (13.8 percent) peers. Underrepresented female critics wrote 4.1 percent of reviews included in the sample. “The very individuals who are attuned to the under- and misrepresentation of females on screen and behind the camera are often left out of the conversation and critiques,” said Smith, founder and director of the Annenberg Inclusion Initiative. The Oscar-winning actress emphasized it's not about racial hatred saying "Am I saying I hate white dudes? No, I’m not." Referring to a recent box office flop she said, "I don’t want to hear what a white man has to say about 'A Wrinkle in Time.' I want to hear what a woman of color, a biracial woman has to say about the film. I want to hear what teenagers think about the film." "If you make a movie that is a love letter to women of color, there is a chance that a woman of color does not have access to review and critique your film," she said. "Do not say the talent is not there, because it is." She also announced plans to roll out an opt-in program that will "provide studios with access to underrepresented journalists and critics". Larson ended her speech saying "Please make sure that these invites and credentials find their way to more underrepresented journalists and critics, many of whom are freelancers." Brie Larson recently finished filming "Avengers 4" as Carol Danvers, the superhero named Captain Marvel. She's also scheduled to star in her own solo film in 2019. Do you think there should be more female critics and critics of color?